Carless, my mother would take us for walks through cow pastures and up grass-covered ski slopes into quiet woods of maple and pine. Mushrooms were the real prize, and as a child, few things beat the thrill of discovering a fairy ring of fragrant golden chanterelles (although admittedly my sister and I were frequently distracted from mushroom picking by the adorable spotted red efts that came out after the rain). I have lovely memories of sitting on steep grassy hills, a hat shielding me ineffectually from the hot sun, brushing aside the leaves and clover for sweet wild strawberries which my mother would later turn into the most heavenly jam, and slightly less halcyon memories of battling brambles and bees to gather raspberries and blackberries. At dinnertime, my mother would send us out to pick thyme from the fields surrounding the little house my parents bought in North Lexington. I rather liked this task. The ground beneath me was warm and dry, shiny green cricket-sized grasshoppers hopped around my legs, and, being a rather grisly child, I would sometimes catch these and ‘feed’ them to the yellow-and-black garden spiders that lived in my mother’s roses. In the cool, shadier parts of the fields by the woods grew delicate, tart, spade-shaped sorrel, which I loved to pluck and eat. I hated being sent to gather sorrel, however. My mother used the sorrel to cook sorrel soup, a dish traditionally eaten in Eastern Europe in the springtime, but she needed masses of sorrel to cook sorrel soup for the four of us. 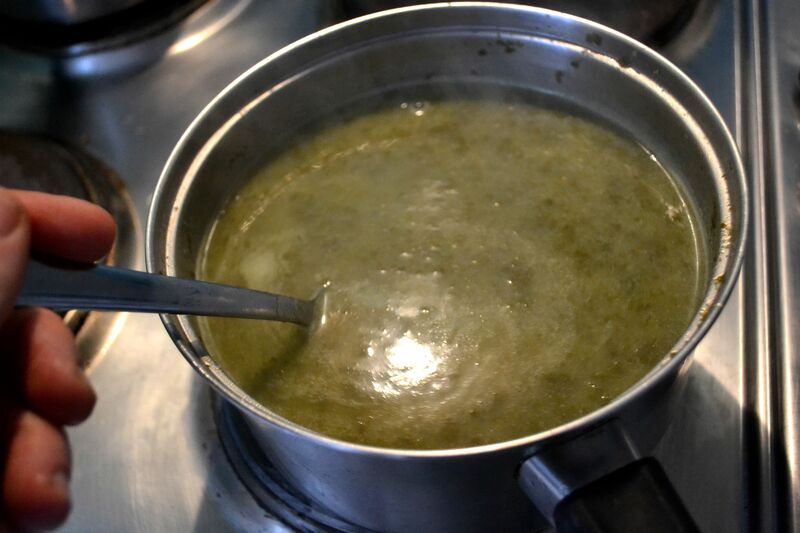 It took hours, it seemed, to pick a bucket of the sorrel leaves, but the soup – strongly tart but not sour – remains one of my favourite taste memories of my childhood. Last week at the little farmers market in Swiss Cottage, a purveyor who sells nothing but fancy greens had a bin of sorrel. When he offered me a leaf to try, the tart crisp taste brought me right back to those endless summers. In this recipe, cooked potatoes are blended with the broth to thicken it slightly (for a more elegant presentation, if you will), but in Poland (my mother tells me), farmers will often make a thin soup using just broth, sorrel, and a bit of sour cream, into which they’ll mix chunks of potato and sometimes carrot. 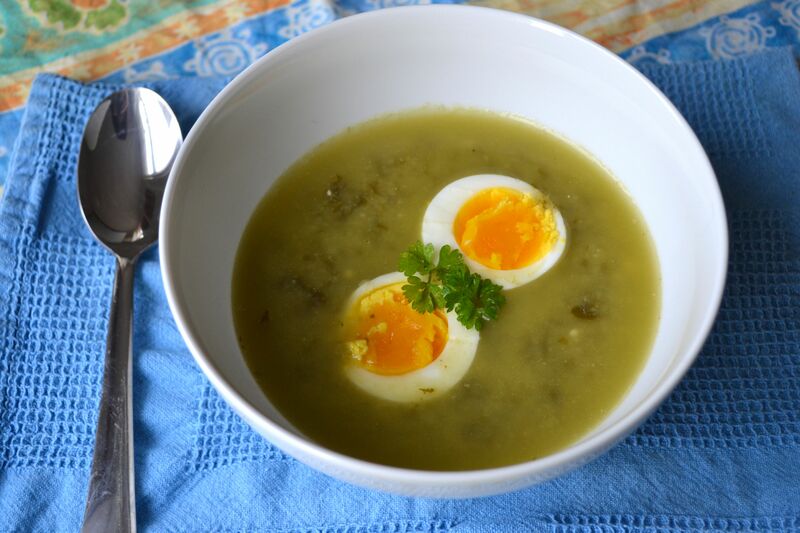 Traditionally, sorrel soup is garnished with hard-cooked eggs. It’s an ideal combination – the rich soft egg yolks coat your tongue and are the perfect counterpoint to the strong, tangy soup. Like all so-called ‘peasant food’, this is simple stuff. Just a few ingredients, mainly things you can grow or gather. 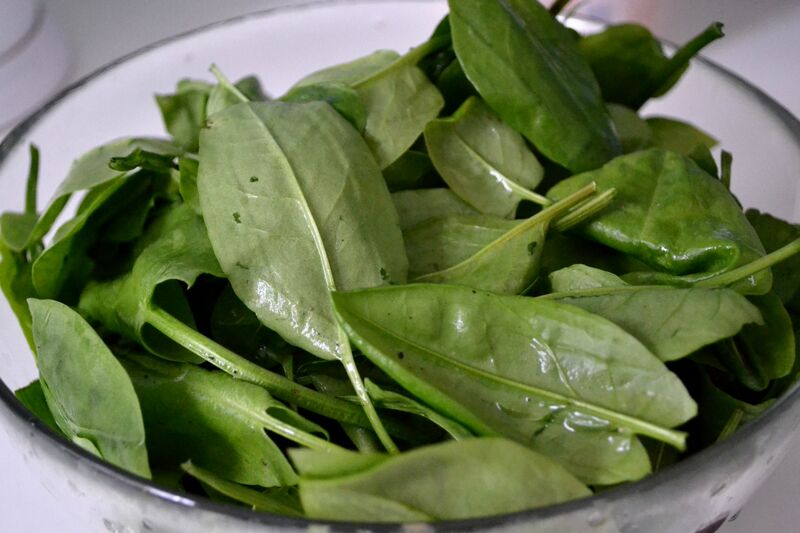 Wash sorrel leaves well and remove the stems. Bring half of the stock to a rolling boil and plunge in the sorrel leaves. They will soften and lose their bright colour almost immediately. Remove from heat, and purée using an immersion blender (stick blender). Set aside. Cook the potatoes in the remaining stock until very soft. Puree with an immersion blender until completely smooth. Stir in the sorrel broth and over medium heat again bring the soup to a gentle boil. Taste and adjust seasonings, adding a few grinds of black pepper. Put the sour cream in a medium bowl and ladle in about half a cup of soup. Whisk together until smooth (this prevents your cream from being lumpy when you add it to the broth) and then combine with the soup. Bring just to a boil and then remove from heat. When ready to serve, boil eggs to desired doneness. Serve soup hot or cold, garnished with sliced eggs and, if desired, with additional fresh herbs. This entry was posted in Recipes, Soups, Vegetarian and tagged comfort food, eggs, Polish, Potatoes, sorrel, sour cream by Susan. Bookmark the permalink. Ohm, we make something like that in Russia – love your version! Thank you for visiting and for the comment Anastasia! The man at the farmer’s market said that many Russians buy sorrel from him. 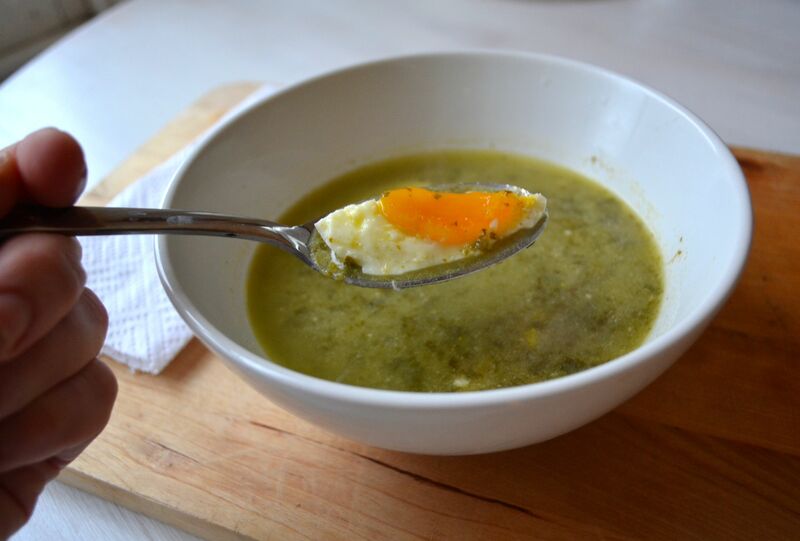 I remember this well — the hardboiled egg mixed with a bit of soup on the spoon is the best part! And do you remember how much we *hated* picking sorrel? What a wonderful post! I just am in love with stories like this. And the soup look wonderful as well. Thank you for sharing! Thank you so much. Personal stories like this one, based (as they usually are) on intimate memories, are always very challenging to write, so it’s nice to know that this reads well. So glad to learn that sorrel is in London markets, as it must mean that spring will soon come here! The bottom photo is so pretty. I have never used jarred sorrel, will have to give it a go. Thanks! Mm. Sounds like a nice change for spring. Must see if sorrel is at the farmers’ market on my next trip. It is a really nice soup, with a lovely tart flavour. Let me know if you do try it! that’s a beautiful story! I first tried sorrel at the farmers’ market and immediately fell in love with its zesty lemony flavour, but always only had it in salad, soup is a first for me. and hurray, spring is finally on its way! Hey Shuhan! You should try sorrel in some of your fabulous soups; I bet whole leaves would add a lovely dimension, especially with, say, noodles and brisket. Thanks as always for the nice comment. Lovely writing, took me right there! 🙂 thanks for the recipe. Lovely soup. My wife, Polish blood, tells me that it’s not as sharp as her Mum’s. So i put in some lemon juice into her bowl, not an improvement! But she still approved. Had some sorrel growing in the garden of the place we bought last year, and this was a wonderful way to cook it. Your childhood backdrop was beautiful to read. JH, thank you for the feedback and thank you for cooking my soup! I consulted my Polish mother, who said that the level of sharpness depends on how much sorrel is added to the soup. In Poland lemon would not be added because it is a peasant soup. Maybe try adding another 50-100 grams of sorrel next time you cook it, if you try it again, and that will give the soup more sharpness. Again, thank you so much for your comment. I’ve just come back home after going to a local fruit and vegi swap and swapped sorrel (growing in my garden) for saltbush berries and garlic chives, tarrigon and sage. i will try your recipe with the edition of bacon. I was hunting for a sour sorrel soup recipe like the one my Lithuanian mother used to make, and I found you. In those early days there was no blitzing so the sorrel was added in cut strips which gave each spoonful the most glorious tangy bite, and made special by a bit of chopped egg. We have a big family event coming up and I am going to use your recipe. Thanks for that. But what I mostly want to say is that your writing is exceptional and wonderfully evocative. If you ever publish, I’ll buy the first 10 copies. I have been on a long hiatus but comments like yours have encouraged me to come back to writing. Thank you! I intend to start blogging again.